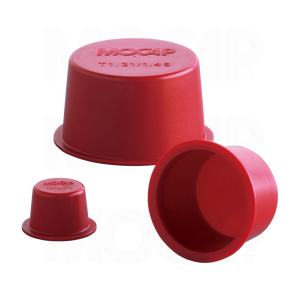 MOCAP T-Series Plastic Cap Plug has a tapered design which allows it to be used as a cap for multiple threaded and non-threaded applications. Use MOCAP T-Series Tapered Cap Plug to plug a wide range of openings, including threaded and non-threaded holes, pipe and tube end plug, connector ports and fittings. MOCAP Cap Plugs can also be used as inexpensive, single use disposable masking caps or masking plugs for painting, coating and spraying processes up to 79°C (175°F). Review MOCAP's complete Line of Masking Products. Most stock sizes are available in Mini-Packs when Smaller Quantities are Needed. To place an order for this product, call 0800 856 2466 or use our Contact Request Form to receive information by e-mail. Many Sizes of Our Tapered Plastic Plug Caps are Stocked for Immediate Shipment.